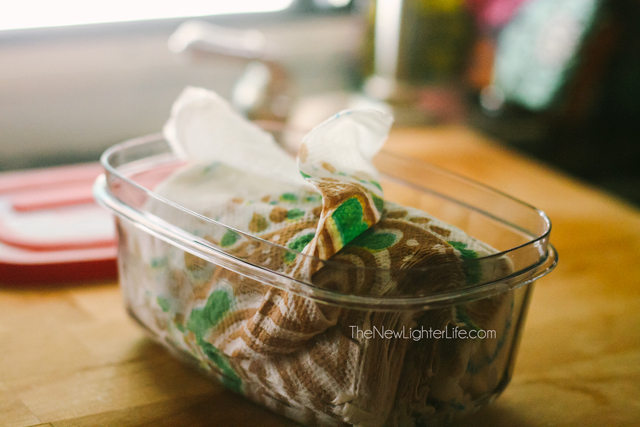 When I wrote about my homemade baby wipes, a reader tipped me off to the possibility of using the homemade wipes as makeup remover wipes. I love her! I don’t know her but I love her! Since she mentioned it to me, I’d been using the homemade baby wipes for removing my makeup. 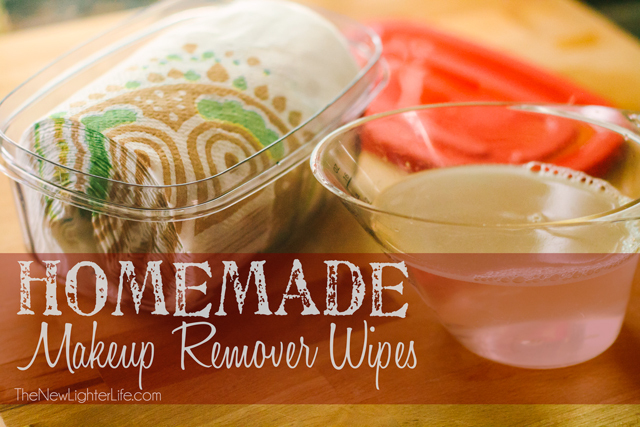 Now I’ve reworked the recipe and have my very own homemade makeup remover wipes that is perfect for removing stubborn waterproof makeup. First I added more coconut oil because my skin is dry and the oil is helpful in removing waterproof mascara. I also make smaller batches because I don’t like my wipes to sit for several months wet. Since we live in an RV and bathroom space is at a premium, I bought a smaller sealable container from Dollar Tree. I replaced the half roll of Bounty paper towels with Bounty napkins, (I promise Bounty is not paying me). I chose Bounty because that particular brand just works better and doesn’t fall apart after sitting in the solution for several weeks. Adjust your batch size as needed. Place napkins in a resealable container. In a separate bowl, mix the water, coconut oil, and baby wash. Stir gently and pour over napkins. Store in a the sealed container. I made a solution like this just the other day! (only I just keep it in a jar, no towels in there too) Make sure you put a few drops of tea tree oil in there–it keeps mold from growing 🙂 Coconut oil also helps with that; however, the coconut oil isn’t strong enough by itself to fight the mold. Following you on Pinterest now! Have you tried, or thought of using, cloth instead of paper? I haven’t Cynthia, but I’m sure it would work just fine.